For delicious tasting milk for tea, coffee, sauces and anything else you use milk for. 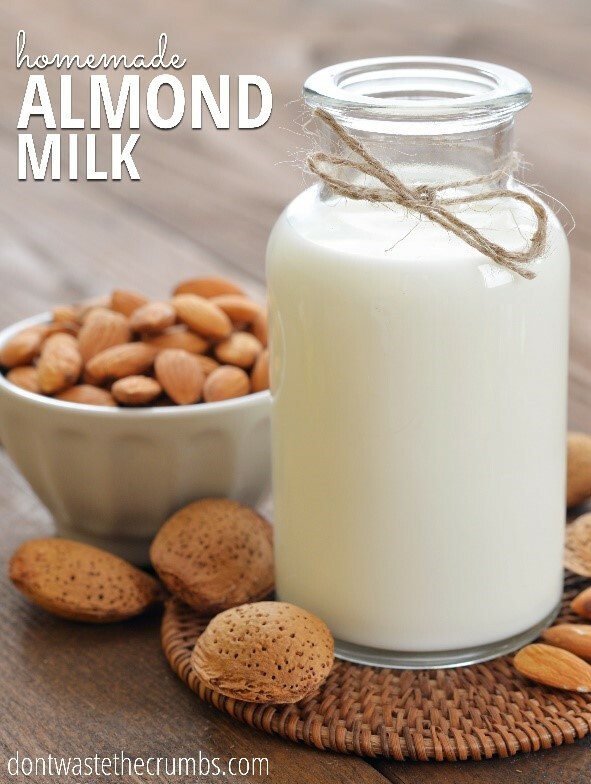 There are masses of almond milk recipes on the internet, you can add vanilla, dates, oils and a host of other things. However, I like to keep it simple, so this is how I make mine. Soak the whole almonds overnight in water with a teaspoon of Himalayan salt – cover well as they expand by about another third. Place these in the fridge or cover and leave on a surface for 8-12 hours. Now rinse them well to remove the salt. Into a blender or Nutribullet, place around 1 cup soaked almonds to 3 cups water (if you like it thinner, put more water in). Filter the almond milk through a nut bag to remove the pulp. You can use a piece of muslin cloth or voile, or even calico. Put it into a jar/jug. It will keep in the fridge for about 4-5 days and can also be frozen.